Ramon Speed grew up in Omaha around the same time as neighbors Simon Joyner and Conor Oberst. They must have crossed paths, the three of them, and I found a random few references here and there online, but it wasn't easy. I think it was a weird time for Omaha, let's face it. But don't let the somber angel statue silkscreen on the cover throw you. Flip it over and there's a couple of skaters, laughing, carrying their boards to another warehouse skate spot. This EP carries the feeling and that connection between the classic universal statement indie and personal anti-production contemporary sound. It's got the best things about home recording from John Davis, Sebadoh, the rest of the unsung indie outsiders that reintroduced me to music on K Recs, Kill Rock Stars in 7" doses. This single brought it all back, I'm excited about the whole scene, it's all worthy of consideration, it's the first thing I ever listened to, it took a huge amount of effort to finally make it to the turntable. This sound is the indescribable thing that was Omaha, hell Saddle Creek then. Maybe it's a complete outsiders perspective of classic 90's indie Americana. The way music was being delivered was just changing and all these new voices sprang up...they were always there, but now they could finally get a real shot, on their own terms. Maybe being in middle America all of the pop culture got filtered down into an area separated by geography, with it's own inner narrative happening to come up with a completely new direction of indie. So it all gets more honest, more sincere. Or that's the only thing that still carries any currency after the 80's was this movement...music from your experience. Sort of along the lines of grunge even...reject the image....that was happening everywhere. If that had something to do with the alienation of suburbia then that was what's honest. I don't know if it was even recognized at the time, or if it took a few years to see the bare honesty of their musical statements. It also sounds like the 13 years in between the good old days and this single haven't changed a thing, for me this could be Lync or Cap'n Jazz, the raw melodic impassioned indie that has to start off with a great rhythm. 'Amputee' has the odd time signature percussion, all flat sounding...It sounds like Ramon recorded all of this live, but there's a restraint that comes from keeping it down all those years at 2 AM upstairs, blankets on the walls. There's a definitive construction, it's been completely thought out, there's no room for free improv. For better or worse I know what I'm doing. the vocals have a little bit of phaser...he's not trying to be a vocalist, he has to be. Then on '36,000 feet'....the combination of just off in the distance piano with those smacking drums....distorted guitar just on the surface, it's perfect. The drums have to be that way, you couldn't capture the immediacy of this if you wanted, it's one of those sincere happy accidents. That's just the A-Side, which I listened to over and over this weekend, thinking about this one. Never even flipped it over. This is a great single all around, 4 tracks at 33 1/3 that recaptured all of the beginnings of indie rock in a personal way. It's great, I'll be tracking down earlier stuff. ramon returns to form on four new cuts, after a lucky thirteen year hiatus. 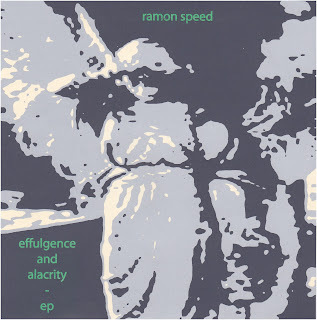 between 1994 and 1996 ramon speed released aproximately 60 songs from the not-always-so-safe confines of the home taping milieu, now nearly a vestige...these efforts were primarily memorialized by chris deden and simon joyners sing, eunuchs! as well as rob carmicheals catsup plate labels. there were also a smattering of compilation appearances along side such genre giants as : the mountain goats, lambchop, the bruces, etc. etc. these four songs dont necessarily pick up where ramon left off, but glow with the same bright light that made him so adored among so few...limited to 300 copies, in multi-colored screenprinted sleeves.